This is a Leprechaun hat card in the shape of a green hat. When you open the card, the inside has a picture of people in a St. Patrick parade and there is a space to write your message. 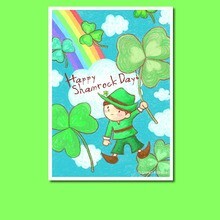 You can insert a shamrock shaped greeting card into the message shape. You can write a message on that card too. 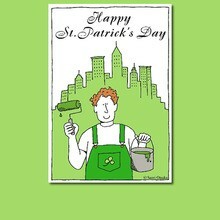 How about sending a message on the perfect St. Patrick's Day greeting card? Cut out the parts and fold them along the fold lines on each. Glue the buckle onto the belt. Glue the belt together along the buckle reference lines then glue the ends together starting from the black belt lines. Write your St Patrick's day message on the inside hat and insert the card into the green hat. Glue the shamrock decoration wherever you like, then fasten the hat belt. Just wait few minutes for the glue to dry. Your Half fold Leprechaun green hat card is completed.